I am continually questioned about why I blog. Often this leads to discussion about who has the right to speak? How do I know if what I am saying is of value? Asking such questions can get us caught in thinking that sharing has some specific consequence or outcome. Thinking like this misses the growth and opportunity that such reflection provides. What I will tell you is that I need to blog more. Not for you, but for me. I need to get back to sharing more frequently, my thinking. Not for you, but for me. Unfinished thoughts, marginal insights and conversations that have sparked my interest need to be shared and explored here. Not for you, but for me. This is the space for me to mull over ideas and thoughts (see what I did there) which is what I intended this to be 10 years ago. The other side of all this is what happens when ideas are shared. Clive Thompson suggests that, “once thinking is public, connections take over.” What is important about these connections is that as much as we try and manage them, they often have a journey that is somewhat beyond me. Whether it be the different experiences and interpretations. What is important isn’t always what we gain, rather it is the potential to start new lines of thought and inquiry. 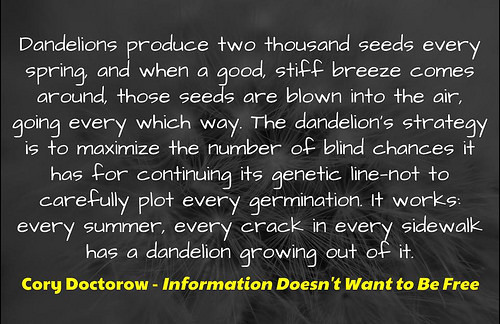 Such seeds have the potential to blossom into untold possibilities. I shared this out on Twitter, where it was then picked up by Camm who took the idea and created a loyalty style card, which he gave out to his staff and me. Giving away ideas and knowledge is a bit like love, as told in the story of Jesus and the feeding of the 5000. You can share it around as much as you like, but you still get to keep it, and there is always plenty left over. 5 Ways to Change the World Yesterday by Aaron Davis is licensed under a Creative Commons Attribution-ShareAlike 4.0 International License. @mrkrndvs wow! Great ideas to explore in that post! !